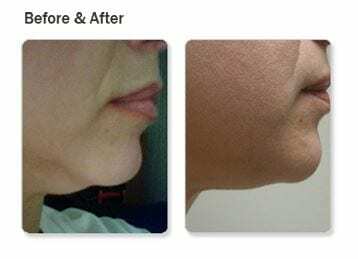 One of my favorite areas to help clients target with facial exercises is the dreaded, but extremely common “double chin.” Also known as the “wattle,” chin fat or submental fat, this condition can be extremely difficult to get rid of. The double chin can be caused by anything from weight loss and genetics to aging. The good news is, Facercise can reduce this condition safely and effectively. Chin fat causes insecurity and angst for those suffering from this condition. Unfortunately, many seek risky surgical procedures to target sagginess in this area. They get plastic surgery, have liposuction or get “fat melting” injections in the area. While this seems like a speedy solution, there are a lot of risks associated with these procedures, and often times, the results are below expectations. There are complications associated with anesthesia, such as post-operative dizziness, nausea and confusion. In more serious cases, side effects can result in pneumonia, stroke, seizure, heart attack and even death. Some patients report dimpling or unevenness in the area. Often times, there is only very slight improvement from these methods. With injectables, patients often have to do multiple courses of treatment, with up to 50 injections in the area each time. Does that sound like fun? Many experience bruising, redness, swelling and even infection in the area after injections or liposuction. Those who opt for injectables may also experience nausea, hypertension, mouth or throat pain, numbness, headache and nerve injury. Anecdotal evidence shows that facial exercises can strengthen, tone and firm the muscles in the chin area. With a regular Facercise practice, you can diminish the appearance of a double chin without any risk of side effects or unwanted results. You can safely lift, tighten and firm the wattle, without spending all your money on expensive plastic surgery. With daily facial exercises, you will see a difference in a matter of weeks. For best results, do all of the exercises included on the Ultimate Facercise DVD. Our muscles operate synergistically so exercising the entire face will make the entire area firmer and more toned. Visit this link to learn more about the benefits of facial exercises and how to get rid of a double chin with the Facercise system.